This was one of a series using my Pentax K-01 mirrorless canary yellow camera last Friday night. It has no view finder but the LCD screen is quite good using "focus peaking" to indicate when an image is in focus. I coupled it with my SMC A series 50mm F1.7 lens for the lower light conditions. It was manual focus but very sweet and not too intrusive, so I could take lots of pictures without drawing attention to myself. For me, the arm being in better focus than the face is distracting. Other than that, great shot though. The framing is good and the photo is interesting. I just think it'd be better with greater depth of field or focused slightly farther back to his face. Its a good shot, alternatively you could focus on the cue ball the subject of his gaze at bit lower angle. 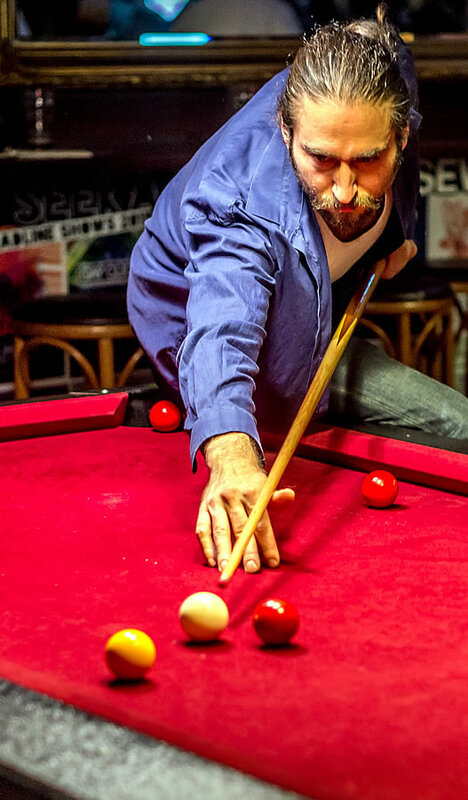 But its a good subject and you don't see many billiards photos.